Then the Hills Were Alive with the Sound of Music! Dressed in their Sunday best frocks these little girls from St Michael's Brownies, Mytholmroyd, are pictured celebrating May Day in the time-honoured way at Cragg Hall in 1937 or '38. Reproduced by kind permission of Mrs Dorothy Tonge. Code noBT 985. The tradition of celebrating May Day had largely fallen out of favour by the beginning of World War Two: unlike the Pace-Egg Play it was not revived in the Calder Valley. 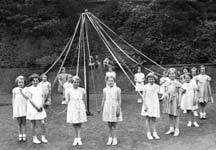 The tradition was still going strong in the late 19th century when maypole dancing was part of Whit Monday celebrations. At Birchliffe Chapel, Hebden Bridge, crowds paraded to Long Royd meadow, known as "Whit Monday Fields," where the maypole took pride of place. Read the full story in Milltown Memories, issue 7. If this or other stories stirs a memory, we'd be happy to know - send us your memories and comments. Don't miss our Summer 2004 issue on sale in June.